A Christmas campaign to raise awareness of falls prevention in the elderly is being launched at Cardiff and Vale University Health Board. 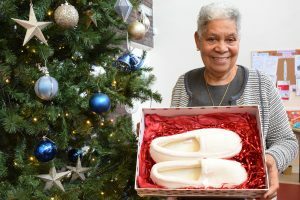 The Slippers for Christmas campaign, now in its second year, encourages people to purchase suitable slippers for elderly relatives, friends or neighbours at Christmas as the best gift you can give a loved one this Christmas is good health and independence. Every month the Emergency Unit at University Hospital of Wales sees over 500 patients who have fallen. Elderly patients who have experienced a fall are generally admitted to hospital where they can become deconditioned, lose confidence on their feet and lose the independence they had in their local community. 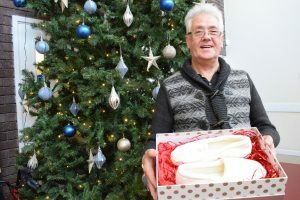 Poor fitting and unsuitable pairs of slippers are one of the causes of falls which is why the Health Board is encouraging people to gift a suitable pair of slippers during the festive season. When buying new slippers make sure that they are close-backed not open-backed, the sole has a good grip, they can be fastened and they do not have a heel. With falls costing the NHS around £2.3 billion per year, Cardiff and Vale UHB is keen to educate people around falls prevention, which can avoid unnecessary admissions to hospital, keep patients independent in their own home and keep their confidence up. Alun Morgan, Assistant Director of Therapies and Health Sciences said “Many of us think that having problems with our balance and getting weaker is an inevitable part of ageing so along with a few wrinkles and grey hairs, the odd fall is to be expected as we get older”. “But falls are preventable and are often a warning sign that something else is wrong. As well as unsuitable footwear or slippers, falls can also be caused by not drinking enough fluids, poor eyesight, urinary infections, poorly controlled blood pressure and medications. “Falls prevention is extremely important, as even a single fall can have significant consequences for that person. They can cause injuries, fractures, loss of confidence, hospital admissions and a loss of independence. Six out of 10 falls happen in the home or garden, so it’s important to remove or repair any hazards that could cause a trip. Clutter around the home, rugs and even household pets are all causes of trips and falls so try and keep walk ways clear to reduce the risk of tripping. Those between the ages of 50 and 70 can lose up to 30% of muscle strength which is why regular exercise is so important. Undertaking low impact exercises can help such as gardening, housework, walking to the shops and avoiding sitting for prolonged periods.